Computer Integrated Manufacturing: From Fundamentals to Implementation is based on a course in computer integrated manufacturing (CIM) which is part of the Production Engineering Tripos for postgraduate-level students at Cambridge University. The book is intended to provide a thorough coverage of a difficult subject, and to communicate principles as well as something of current practice. 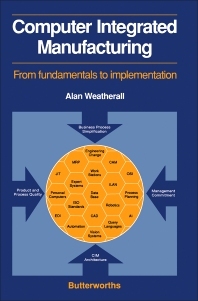 This should give a firm basis of knowledge in CIM, and develop an understanding that will be valid for many years in changing business and manufacturing environments. The book covers CIM and manufacturing systems at a technical level, from description of the conventional ""islands of computerization"" to the components of CIM architecture. The business objectives of CIM are described, from analysis of the business environment to cost justification and implementation of CIM systems. CIM is seen as a business tool and not as an end in itself. Each individual and company needs to adapt the tools described in this book to best effect. Study of this book should enable postgraduate students and professional engineers to deal confidently with the subject and use CIM techniques profitably. What is a CIM Architecture? Why Have a CIM Architecture?